This post was in partnership with Visit Carmel, thank you for helping make our trip one to remember! 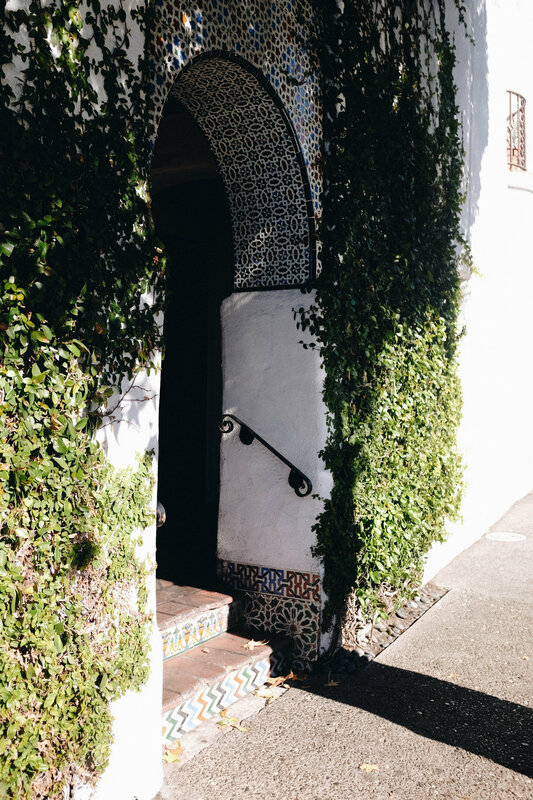 If there's one place that I'd consider a hidden gem in California, it's Carmel-by-the-Sea! This charming city is home to some of the best culinary cuisines, beautiful beaches, and prosperous local communities. The weekend before Christmas Kev and I took a few days to spend some time exploring the Carmel area, eating and drinking our way through downtown and of course soaking up the beautiful Pacific coastline views. We kicked off our stay in Carmel at the Carmel Country Inn, the B&B is the perfect example of the local aesthetic, and couldn't have been more inviting! One thing you'll notice about the Carmel area is how dog-friendly the community is. Part of this appeal has also earned travelers with four-legged companions accommodations at many of the local hotels, including the Carmel Country Inn. One of the best things about Carmel is their downtown area, which is packed full of boutiques, art galleries, and delicious eateries. I was so happy that we were able to visit while the shops were decorated for the holidays, it was the perfect way to get into the spirit and also gave me an excuse to enjoy a few extra treats. Having been to Carmel in the past I was familiar with a few must-stop locations. One of them that always makes my list is Carmel Valley Roasters! If the smell of roasted coffee beans isn't enough to entice you to walk in, their selection of fresh baked goods and deli treats definitely will. The prices may seem a bit steeper than the average cup of joe, but trust me, it's well worth it! A.W. Shucks is the place you want to hit for cocktails and equally as delicious seafood! We indulged during our visit and kicked off our meal with their noteworthy bloody marys. Kev even made of point of saying that it was the best one he's had in a long time! For starters, we both chose the Clam Chowder, which was rich, delicious and everything that chowder should be! Since we are on a roll, we completed our lunch with the tuna melt and fish and chips. Overall the menu was classic, with plenty of seafood options (we actually had a hard time deciding what to order!) The atmosphere was very casual and more of a pub grub spot. We made our way to Vesuvio for dinner on our first night, I loved that we were within walking distance and able to enjoy a few glasses of wine without having to worry about parking or driving. The restaurant was packed, and it was clear it was one of the more popular spots in town. We each started with wine, which we thought was very reasonably priced, along with their must-have Asian-Italian sushi rolls! I know that you're probably thinking, Italian sushi? Yes, and it was out of this world! We went with the spicy tuna & garlic bread crusted roll, which was made with saffron rice and served in a sweet reduction sauce. I would highly recommend this as a starter for any meal. We followed this with an order of Osso Bucco and the surf n' turf! Normally, I'm not a huge fan of lamb, but this dish may just change my opinion. The shank is braised for 4 hours and served in a savory sauce with fluffy whipped mashed potatoes. It was one dish that was hard to share since it was so good! Kevin was equally as happy with his meal (pictured above) of grilled and sliced flank steak, topped with a tempura prawn, served in a sweet soy reduction sauce. We would definitely go back to this trattoria, especially if we were dining with a larger group. It was a little too cold to dine outside, but they also have accommodations for light bites and cocktails upstairs on their deck! If you're looking for a dining experience to talk about for years to come, then Anton & Michel is the place to go! The dining atmosphere is formal without feeling stuffy or unapproachable. The open dining room offered views into their courtyard, which provided the perfect ambiance for our date night. We started with two glasses of red, and we pleasantly surprised with their curated wine list which was quite extensive! We followed our wine selection with a cup of french onion (my favorite) and a classic Caesar salad. The french onion tasted exceptional and definitely was something I would return for! For our main entrees, Kevin ordered the short ribs and I went with the chicken and root vegetable gnocchi. While both meals were superb, the short ribs reined supreme, the meat was incredibly tender and paired perfectly with our wine selection and accompanied potatoes. I'd certainly be leaving something out if I didn't speak about the service provided! The manager, Luis went above and beyond to take care of us during our dining experience, including serving up table-side banana fosters, I mean does it get any better than that? 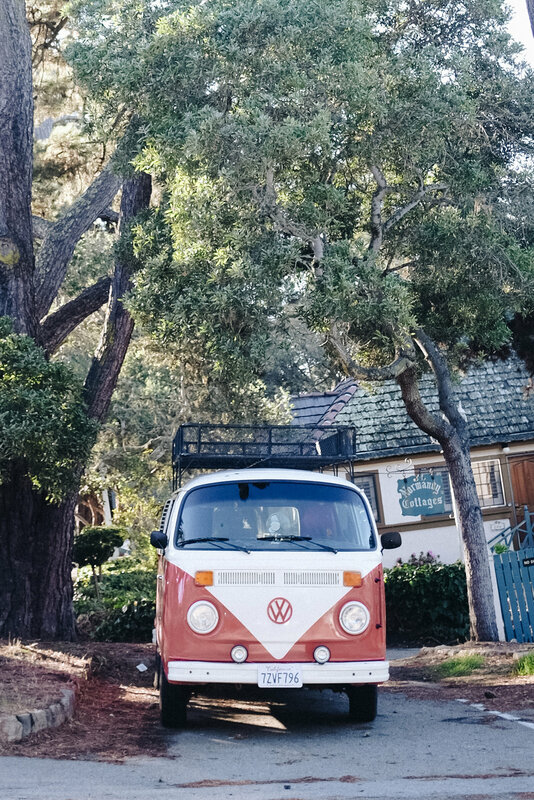 The small beach town vibes ring true in Carmel! Kev and I woke decided to wake up a little earlier on our second morning and grab a coffee from Carmel Valley Roasters and take a walk down Ocean street to the beach. There were a ton of people out running, walking their dogs, and enjoying the breathtaking views. The walk wasn't far from where we were staying, in all honesty, everything is pretty centrally located so you won't need to trek across town in order to get anywhere. On the second day of our stay, we decided to roam the downtown area and do a bit of wine tasting. There are a ton of local wineries who have tasting rooms in Carmel who offer an array of different varietals, so there's sure to be a favorite for everyone. We wandered into Carmel Road first and loved that we ended up having the tasting room to ourselves. Carmel Road specializes in Pinots (our fav). We ended up visiting a total of 4 tasting rooms that day (which I'll share below). If you're interested in purchasing a wine walk passport, you can do so here >> WINE WALK, or through the chamber of commerce in downtown. Have you ever been to Carmel? If so, I'd love to hear about your favorite places!